Welcome_To_LegacyChillers_roadsign_b | Legacy Chiller Systems, Inc. Check out the video and download the Competitive Scorecard PDF. Each year Legacy Chiller Systems hires an independent engineering research firm to perform a detailed review of the most requested process chiller features and factory installed options. The comparative review provided how Legacy’s products stack up against our USA based competitors. We are proud to say that Legacy Chiller Systems has remains the overall highest rated process chiller manufacture in the USA. Honest, and reliable company to offer chiller product line for. Legacy has been a pleasure to work with since 2015. I approached his team with thoughts of offering his chiller systems as a secondary product line, as we already are a chiller chiller manufacturer. This was due to the fact we could not keep up with orders as well as they design systems differently than our systems and this gives a broader offering to clients. 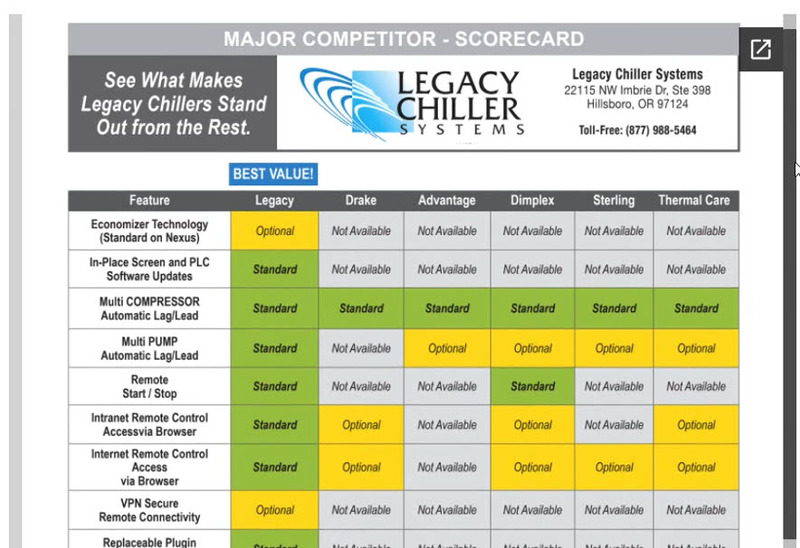 Legacy Chiller Systems is good American company to work with and resell for. at JC Younger and Company. Having been in the HVAC – Mission Critical support world for a long time, 35 years, I have learned to recognize quality. Yes, Legacy has that covered. My definition of chillers stands high above the norm. Martin King and his team know what service is. They answer the phone, they make things right when they are not and the well-designed, high performance culture will bubble from that. Legacy has been on my radar for several years, they are always eager to help. Vice President at Mission Critical Facilities & Technology. If you want to contact us about any issue please call 877-988-5464 or send us an e-mail.